Last week, Ann from Ann's Snap Edit Scrap wrote a post about these cute little things she'd created from toilet paper rolls (click the link above). They are adorable, don't you think? Well, since you showed me yours, I'll show you mine. Ann, as you can see they are far from pretty. But they do the deed...LOL! See, everything in life has a purpose whether it's to make you smile, as your creations did or keep things orderly and tangle free because I'm an organizational nut...LOL! 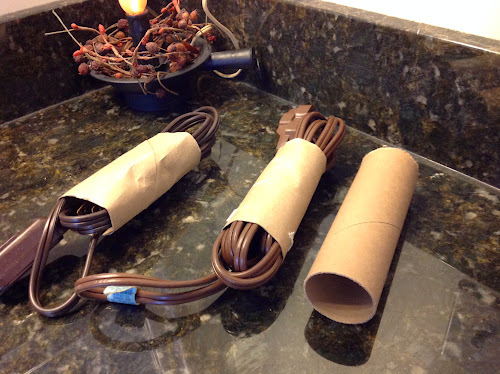 What a brilliant idea and I can imagine using paper towel rolls for similar items. Thanks so much. My granddaughter a few years back made a Christmas garland for her front door from toilet rolls, painted of course and decorated but it was very pretty. Oh, what a great idea. I think I will try that. Thanks. I'm already accused of not throwing stuff out. Looks like I'm going to be saving toilet paper rolls next! Well, it kept the toilet paper organized and tangled free for quite a while. I'm afraid I just toss mine but now I'm getting ideas.